Cerebral palsy means 'brain paralysis'. It is adisability that affects movement and body position. It comes from brain damage that happened before the baby was born, at birth, or as a baby. The whole brain is not damaged, only parts of it, mainly parts that control movements. Once damaged, the parts of the brain do not recover, nor do they get worse. However, the movements, body positions, and related problems can be improved or made worse depending on how we treat the child and how damaged his or her brain happens to be. The earlier we start, the more improvement can be made. In many countries cerebral palsy is the most frequent cause of physical disability. In other countries it is second only to polio. About 1 of every 300 babies is born with or develops cerebral palsy. At birth a baby with cerebral palsy is often limp and floppy, or may even seem normal. Baby may or may not breathe right away at birth, and may turn blue and floppy. Delayed breathing is a common cause of brain damage. Slow development Compared to other children in the village, the child is slow to hold up his head, to sit, or to move around. He may not use his hands. Or he only uses one hand and does not begin to use both. Feeding problems The baby may have difficulties with sucking, swallowing and chewing. She may choke or gag often. Even as the child gets bigger, these and other feeding problems may continue. Difficulties in taking care of the baby or young child. Her body may stiffen when she is carried, dressed, or washed, or during play. Later she may not learn to feed or dress herself, to wash, use the toilet, or to play with others. This may be due to sudden stiffening of the body, or to being so floppy she 'falls all over the place'. The baby may be so limp that her head seems as if it will fall off. Or she may suddenly stiffen like a board, so that no one feels able to carry or hug her. The baby may cry a lot and seem very fussy or 'irritable'. Or she may be very quiet (passive) and almost never cry or smile. Communication difficulties The baby may not respond or react as other babies do. This may partly be due to floppiness, stiffness, or lack of arm gestures, or control of face muscles. Also, the child may be slow in beginning to speak. Later some children develop unclear speech or other speaking difficulties. Although parents find it hard to know exactly what the child wants, they gradually find ways of understanding many of his needs. At first the child cries a lot to show what he wants. Later he may point with his arm, foot or eyes. Intelligence Some children may seem dull because they are so limp and slow moving. Others move so much and awkwardly they may appear stupid. Their faces twist, or they may drool because of weak face muscles or difficulty swallowing. This can make an intelligent child appear mentally slow. About half of the children with cerebral palsy are mentally retarded, but this should not be decided too soon. The child needs to be given help and training to show what she is really like. Parents can often tell that she understands more than she can show. With help and training, some children who have been considered retarded prove to be quite intelligent. Sense of touch, pain, heat, cold, and body position are not lost. However, the children may have trouble controlling movements of their bodies and trouble with balance. Because of their damaged brains they may have difficulty learning these things. Patient teaching with lots of repetition can help. Cerebral palsy is different in every child. Different experts have worked out different ways of describing it. But do not worry about labeling a child's particular type of cerebral palsy. This does not usually help his treatment. It is helpful, however, to recognize 3 main ways that cerebral palsy can appear. In a particular child, it may appear in one or another of these ways-but usually in some sort of combination. The child who is 'spastic' has muscle stiffness, or 'muscle tension'. This causes part of his body to be rigid, or stiff. Movements are slow and awkward. Often the position of the head triggers abnormal positions of the whole body. The stiffness increases when the child is upset or excited, or when his body is in certain positions. The pattern of stiffness varies greatly from child to child. These are slow, wriggly, or sudden quick movements of the child's feet, arms, hands, or face muscles. The arms and legs may seem jumpy and move nervously, or just a hand or the toes may move for no reason. When he moves by choice, body parts move too fast and too far. Spastic movements or positions like those shown above may continually come and go (constantly changing muscle tension). His balance is poor and he falls over easily. Most children with athetosis have normal intelligence, but if the muscles needed for speech are affected, it may be hard for them to communicate their thoughts and needs. Typical athetoid arm and hand movements may be as a regular shake or as sudden 'spasms'. Uncontrolled movements are often worse when the child is excited or tries to do something. The child who has 'ataxia', or poor balance, has difficulty beginning to sit and stand. She falls often, and has very clumsy use of her hands. All this is normal in small children, but in the child with ataxia it is a bigger problem and lasts longer (sometimes for life). Because children who have mainly a balance problem often appear more clumsy than disabled, other children are sometimes cruel and make fun of them. Many children who have spasticity or athetosis also have problems with balance. This may be a major obstacle in learning to walk. However, much can often be done to help a child improve her balance. NOTE: Children with any type of cerebral palsy as babies are often mainly limp or floppy. Stiffness or uncontrolled movements begin little by little. Or the child may be limp in some positions and stiff in others. Although most cerebral palsy children fit one or another of these patterns, check also for minor problems in other parts of the body. In each child with cerebral palsy, the parts of the brain that are damaged are different. The causes are often difficult to find. Infections of the mother while she is pregnant. These include German measles and shingles (herpes zoster). Differences between the blood of mother and child (Rh incompatibility). Problems of the mother, such as diabetes or toxemia of pregnancy. Inherited. This is rare, but there is a 'familial spastic paraplegia'. No cause can be found in about 30% of the children. Lack of oxygen (air) at birth. The baby does not breathe soon enough and becomes blue and limp. In some areas, misuse of hormones (oxytocics) to speed up birth narrows the blood vessels in the womb so much that the baby does not get enough oxygen. The baby is born blue and limp-with brain damage. Birth injuries from difficult births. These are mostly large babies of mothers who are small or very young. The baby's head may be pushed out of shape, blood vessels torn, and the brain damaged. Prematurity. Babies born before 9 months and who weigh under 2 kilos (5 pounds) are much more likely to have cerebral palsy. In rich countries, over half the cases of cerebral palsy happen in babies that are born early. Very high fever due to infection or dehydration (water loss from diarrhea). It is more common in bottle-fed babies. Brain infections (meningitis, encephalitis). There are many causes, including malaria and tuberculosis. Lack of oxygen from drowning, gas poisoning, or other causes. Poisoning from lead glazes on pottery, pesticides sprayed on crops, and other poisons. Bleeding or blood clots in the brain, often from unknown cause. Brain tumors. These cause progressive brain damage in which the signs are similar to cerebral palsy but steadily get worse. 2. Is cerebral palsy contagious? No! it cannot be passed from one child to another. 3. Can persons with cerebral palsy marry and have children? Yes. And the children will not have the condition (except maybe in a very rare type of cerebral palsy). 4. What medical or surgical treatment is there? Except for drugs to control fits, medicines usually do not help. (Although medicines to reduce spasticity are often prescribed, they usually do no good, and may cause problems.) Surgery is sometimes useful for correcting severe, stubborn contractures. However, surgery to weaken or release spastic muscles is less often effective and sometimes makes things worse. Careful evaluation is needed. Surgery usually should be considered only if the child is already walking and has increasing difficulty because of contractures. In a child who cannot balance well enough to stand, surgery usually will not help. Sometimes surgery to separate the legs can help make cleaning and bathing easier. The child with cerebral palsy will become an adult with cerebral palsy. Searching for cures will only bring disappointment. Instead, help the child become an adult who can live with her disability and be as independent as possible. Families can do a lot to help these children learn to function better. Generally, the child who is more intelligent will learn to adapt successfully to her condition. However, intelligence is not always necessary. In fact, some intelligent children become more easily frustrated and discouraged, so they stop trying. Extra effort is needed to find new and interesting ways to keep them progressing. Even severely retarded children can often learn important basic skills. Only when mental damage is so great that the child does not respond at all to people and things is there little hope for much progress. However, before judging the child who does not respond, be sure to check for deafness or loss of eyesight. IMPORTANT: Rather than try to treat the symptoms of cerebral palsy, we can do more for the child if we help her with development of movement, communication, self-care and relationships with others. Sometimes we can partly correct the symptoms through helping the child develop basic skills. Family members can learn to play and do daily activities with the child in ways that help her both to function better and to prevent secondary problems such as contractures. Most important is that the parents (and grand-parents!) learn not to do everything for the child. Help her just enough that she can learn to do more for herself. 6. Will my child ever be able to walk? We all need to realize that walking is not the most important skill a child needs-and it is certainly not the first. Before a child can walk he needs reasonable head control, needs to be able to sit without help, and to be able to keep his balance while standing. Most children with cerebral palsy do learn to walk, although often much later than normal. In general, the less severely affected the child is and the earlier she is able to sit without help, the more likely she is to walk. If she can sit without assistance by age 2, her chances for walking may be good-although many other factors are involved. Some children begin to walk at age 7, 10, or even older. 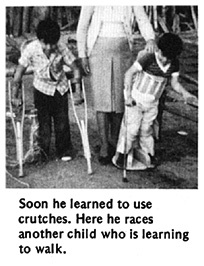 Hemiplegic and diplegic children usually do learn to walk, although some may need crutches, braces, or other aids. Many severely affected children may never walk. We need to accept this, and aim for other important goals. Whether or not the child may someday walk, he needs some way to get from place to place. Here is a true situation that helped us to realize that other things are more important than walking. 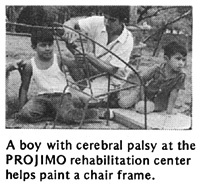 In a Mexican village, we know 2 brothers, both with cerebral palsy. Petronio walks but with great difficulty. Walking tires him and makes him feel so awkward that he stays at home and does not play or work. He is unhappy. His brother, Luis, cannot walk. But since he was small, he has loved to ride a donkey. He uses a wall to get off and on by himself. He goes long distances and earns money carrying water. He is happy. There are many different ways to help children who cannot walk, or who walk with difficulty, get where they want to go. These include wheelboards, wagons, wheelchairs, special walkers, and hand-pedal tricycles. Many of these are described in PART 3 of this book (see the Index). what the child can do. what he looks like when he moves and when he is in different positions. what he cannot do, and what prevents him from doing it. 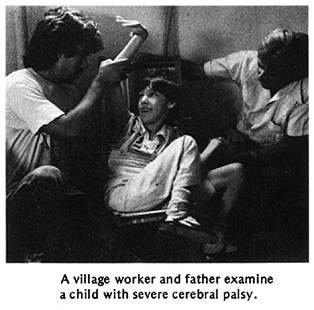 A village worker and father examine a child with severe cerebral palsy. lift her head? hold it up? sit? roll over? pull herself along the floor in any way possible? crawl? walk? How does the child use her hands? Can she grasp things and hold on; let go; use both hands together (or only one at a time)? Can she use her fingers to pick up small stones or pieces of food? How much can the child do for herself? Can she feed herself; wash herself; dress herself? Is she 'toilet trained'? What can the child do in the home or in the fields to help the family? It was difficult for the grandmother not to bring her grandson a cup of water - especially when he begged her. But she understood that in the long run it would do him more good to manage for himself. 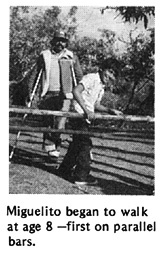 For more ideas about how a family can help a child with cerebral palsy, read the story of Maricela on pages 5 to 7 and the story of Enrique on page 288.
her head is straight up and down. her body is straight (not bent, bowed, or twisted). both arms are straight and kept away from the sides. both hands are in use, in front of her eyes. she bears weight equally on both sides of her body - through both hips, both knees, both feet or both arms. Encourage positions that the child can manage at her stage of development. Play with her, talk with her, give her interesting things to do in these positions. Not all children will be able to stay in these positions without some kind of support. Special chairs, tables, wedges, pads, or bags of clean sand may be needed to keep a good position. For example, the child at the top of the page might need a chair like this. Note: Remove straps and supports as soon as the child is able to stay in a good position. WARNING: Do not leave a child in any one position for many hours as his body may gradually stiffen into that position. Change his position often. Or better, encourage him to change it. If he can change his own position effectively, then chairs, seats, and other aids must not prevent him from moving. AIDS SHOULD RESTRICT A CHILD'S MOVEMENT AS LITTLE AS POSSIBLE. encourage her to reach out and hold objects . Or she may need a post to hold on to. she needs actions that bend her head, body, and shoulders forward, like these. Corrective actions and positions can be found while working in the fields, in the home, or while playing with brothers and sisters. Here are some more suggestions for corrective positions (from physical therapists Nancy Finnie and Sophie Levitt). Try to find ways for the child to be in positions that correct or are opposite to his abnormal ones. or in a car tire swing. help position him so he can lift his head using his arms. For more suggestions on head control, see Page 302. A child with cerebral palsy is often very stiff when it comes to twisting or rotating the main part of her body. However, such twisting is necessary for learning to walk. Rolling also helps develop body twisting. 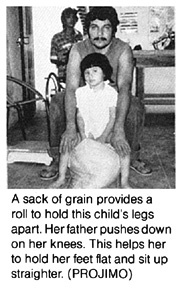 If the child is very stiff, first help her 'loosen up' by swinging her legs back and forth. Then help her learn to twist her body and roll. Figure out games so that the child wants to twist, and does it without help. For more ideas to develop twisting and rolling, see Page 304.
sit him with his legs apart and turned outward. Also lift his shoulders up and turn his arms out. Look for simple ways to help him stay and play in the improved position without your help. Sitting with the legs in a ring helps turn hips outward. For the child with spasticity who has trouble sitting, you can control his legs like this. This leaves your hands free to help him control and use his arms and hands. Help the child feel and grasp parts of his face. Sit the child on your belly with his legs spread and feet flat. Give support with your knees as needed. As he begins to reach for his face, help his shoulders, arms, and hands take more natural positions. Make a game out of touching or holding parts of his face. MAKE IT FUN! As the child develops, encourage her to put her arms and body in more normal positions through play and imitation. Children who have trouble with balance (from cerebral palsy, polio, or other disability) often sit with their legs in a 'W' in order not to fall over. Sitting in a "W" should usually be discouraged because it can increase contractures and loosen or damage hips and knees. However, if it is the only way a child can sit and use her hands, it should be allowed. Look for ways for the child to sit with legs spread forward. Here are 2 examples. The pot or log keeps the knees apart. The holes for heels help too. first sit him with his body bent forward and his legs together. Then bend his shoulders forward and turn them in. Look for ways that the child will sit and play in the improved position without help. Play with her at a table. Sit across from her to have her reach forward for toys with both hands. Be sure her feet are on a flat surface. For ideas on special seats and sitting positions to prevent 'knock-knee' contractures, see below. Other ideas on special seats for children with cerebral palsy are on pages 308, 573,607 to 612, 621 and 624. Because children with cerebral palsy are usually delayed in walking, they need other ways to get from place to place. The methods used will depend on both the needs and abilities of the child- also the resources, skills, and imagination of family, friends, and local craftspersons. Aids for ways to get from place to place should provide corrective positions. The following examples are all designed to help prevent 'knock-knee' contractures. They also provide other types of corrective positioning. Some children will need wheelchairs. For wheelchair designs, see Chapters 64, 65 and 66. For special cushions, to help hold a child's hips back and her knees apart, see Page 609. For other wheelboard designs, see Page 618. Many children with cerebral palsy stand and walk in strange positions. A child's unsure balance often increases the uncontrolled tightening of certain muscles and makes balance even more difficult. As a result the child stands in an awkward position that can lead to deformities and contractures. When you help the child keep her balance, she is less tense and can stand straighter. Look for ways to provide similar assistance during play and other activities. Here a cart provides easier balance and keeps the arms straight. Two sticks can help the child once she develops some standing balance. At first you can hold the tops of the sticks. But let go as soon as possible. CAUTION: Be sure sticks are taller than child so that she will not injure herself if she falls. The child who cannot yet stand alone can be placed in a standing frame for an hour or 2 each day. Even for the child who may never stand alone or walk, standing in a frame helps prevent deformities. It also helps the leg bones grow and stay strong. Start at about the age normal children begin to stand-around one year old. For ideas on 'standing frames' see Page 574 and 575. Try to find ways that the child can play or do things using her hands while she is in the corrective positions of sitting, standing or lying. Encourage her to touch, feel, and handle as many different shapes and surfaces as possible: things that are big, small, hot, cold, sticky, smooth, prickly, hard, soft, thin, and thick. For more ideas of developing use of the hands, see Page 305. As in other activities, try to carry a child in positions that work to correct abnormal positions. do not carry him like this. Carry him in ways that straighten his arms and bend his knees and hips. As the child gains more control, you can carry him with less support. The child with severe spasticity who tend to straighten and arch backward can be carried like this. For play, you can swing the child in the air in this position. For other good carrying positions, see Page 303. Abnormal muscle tightness often leads to contractures (muscle shortening and reduced motion of joints, see Chapter 8). In time, the muscles that keep a limb bent become shortened so that the limb cannot straighten even when the muscles relax. But with care, contractures can often be prevented. Chapter 8 discusses contractures, and ways to prevent and correct them. Page 79 explains how to tell spasticity from contractures. Decreased range of motion may be caused partly by spasticity and partly by contractures. Therefore, whenever a child has spasticity, check to see if contractures are also forming, and if so, how much. This girl with cerebral palsy has spastic muscles that hold her knees tightly together. In cerebral palsy, it is important that steps to prevent contractures be included in activities that help the total development of the child. Many of the corrective positions we have already suggested for activities such as lying, sitting, standing, and moving about are helpful in preventing contractures. When there are signs of developing contractures, give even more time and care to corrective positions. Although the reasons contractures form in cerebral palsy and polio are different, many of the stretching and holding exercises discussed in Chapter 8, "Contractures," and in Chapter 42, "Range-of-Motion and Other Exercises," will be helpful. However, in cerebral palsy, take care to do exercises in ways that do not increase spasticity, but help to relax the spastic muscles. 1. Apply warm soaks (see Page 132) to spastic muscles or have the child sit or lie in warm water. In some countries, people and even therapists use massage, or rubbing, to try to relax spastic muscles. Although massage often helps relax muscle spasms, cramps, or tight muscles from other causes, in spasticity, massage usually increases the muscle tightness. As a general rule, DO NOT MASSAGE SPASTIC MUSCLES. Pulling or pushing directly against spastic muscles causes them to tighten more. To correct abnormal positions, sometimes you can use 'tricks' to release or 'break' the muscle spasms. Muscle tension in any part of the body is affected by the position of the head and body. Spasms that straighten the legs and pull the knees together can be partly relaxed by bending the head and back forward. Do not pick up the child like this. Her head will bend back and her whole body and legs stiffen more. If you roll her a little to one side, it will be easier to bend her head and back forward. This relaxes her hips and legs so that they also bend. Whatever you do with the child, look for ways that will help relax and stretch the tight muscles. Here are some examples. Rosa's body stiffens backward, while her knees straighten stiffly and press together. To wash between her legs, do not try to pull her legs apart at the ankles. This will make her legs pull together more tightly. Instead, put something under her head and shoulders to bend them forward. This helps to relax the stiffness in her whole body. Then bend the legs and slowly separate them. If you hold them above the knees, they will open more easily. Washing will be easier with her knees bent. After washing her (with warm water, if possible) you can help stretch the tight muscles. Slowly open her legs as wide as they will go, and then gradually straighten her knees. do not try to pull her head forward. It will push back more. You may find that her head relaxes more if you put your arm across the back of her neck and push her shoulders forward. Or, you may find that raising the front of the chair seat keeps her hips bent, relaxes her in general, and gives her much more control. do not try to pull them straight. They will stiffen more. Try holding her arms above her elbows, and gently turning her arms out and straighten them at the same time. not for others. Keep trying different ways until you find what works best. Most children with cerebral palsy develop basic skills and abilities more slowly than other children. This is partly because of their difficulty with balance and movement. Also, in some children, mental slowness or problems with seeing or hearing make learning more difficult. Because slow development occurs with many different disabilities, we discuss activities for child development in a separate section of this book. In this chapter, therefore, we give only a few suggestions for assisting a child with cerebral palsy to learn new skills. To understand better how to help a child with cerebral palsy develop early skills, you also need to read other chapters. Chapters 34 and 35 are about helping the child whose mind and/or body are slow to develop. Chapters 36 to 41 discuss ways of helping children develop and become more self-reliant. Although Chapters 34 to 41 are written to help any children who are slow to develop, many suggestions are included for the specific needs of the child with cerebral palsy. These are marked with in the margin. To help a child develop new skills, first observe all the things that she can and cannot do. Like a normal baby who progresses stage by stage in a certain order, the child with cerebral palsy must do the same. Charts showing the normal 'developmental milestones' are on pages 292 and 293. You can use them to help decide the next steps or skills that the child may be ready to learn. Move ahead at a speed that fits your child - not too fast and not too slow. Remember that positioning is very important. When the child has been helped to lie, sit, and stand in ways that give him better positions and control, he will start learning to do things he could not do before. Good balance is one of the most important goals for the development of the child with cerebral palsy. It is important to help a child improve her balance from as young an age as possible. At each stage of the child's development-lying, sitting, creeping, standing, and walking-better balance is needed to progress to the next stage. Detailed suggestions of activities to improve balance are included in Chapter 35, "Early Stimulation Activities," especially pages 306 to 312. Here we give you a brief look at some of the basic suggestions explained in more detail in that chapter. If when you sit a child over 10 months old, she falls stiffly to one side with no effort to 'catch' herself, her balance is poor. If she can balance using her arms when you gently push her, her balance is fair. If she can do it by bending her body, without using her arms, her balance is good. Lie him on your body and tip a little from side to side so that he begins to catch himself. Let her start to fall so that she begins to catch herself. Sit her across your knees. Raise one knee so she has to balance. As the child improves, use a tilting board. Encourage the child to twist and reach to the side. Use as little sitting support as needed. Often low back support is enough for a child who straightens stiffly. Note: Some children advance to standing without ever crawling. Sniff weight from one arm to the other. Provide support as needed, and gradually take it away. Shift weight from one leg to the other. Play trying to balance on a tipping surface. Crawl forward, sideways, and backward. CAUTION: Not for a child with bent-knee spasticity. Whenever possible, turn these activities into games. Talk to the child a lot while you do them to help develop language skills at the same time (see Page 313). Help the child become as independent as possible in eating, dressing, washing, toileting, and in meeting other daily needs. Do this by guided practice, imitation, and step-by-step learning. These self-care skills are discussed in Chapters 36 to 39. Keep experimenting until you find what works best. For example, this girl, with poor body and hip control, tends to 'fall through' the space between her arms when the handgrips on the walker are upright. She does much better on a higher walker with a handgrip that runs from one side to the other . Carla walks in a very crouched position. and that the above-knee braces will make balancing even harder. You will need to experiment! IMPORTANT: Practice in learning skills should take place with family and friends so that the child develops skills in relating to others. However, the child will also need time to practice her skills alone and with the person who is mainly responsible for treating or teaching her. CAUTION: Many suggestions for developing basic skills are discussed in Chapter 34, "Child Development and Developmental Delay," and Chapters 36 through 39 on developing skills for self-care. However, for the child with cerebral palsy, some of these activities will need to be done differently to help reduce and not increase muscle spasms. If any activity increases spasticity, try it differently until you find a way that reduces muscle tension and improves position. Good nutrition of the mother, both before and during pregnancy, reduces the chance of premature birth - and of cerebral palsy. If possible, girls should avoid pregnancy until full grown (16 or 17 years old). Avoid unnecessary medicines during pregnancy. Try to avoid getting near persons with German measles during pregnancy. Or get vaccinated against German measles before becoming pregnant. or by using injections or hormones (oxytocin, pituitrin, etc.) before the child is born. Vaccinate the baby (especially for measles). If the fever is high, wet the child and fan him until he is cooler. Never wrap the baby up in clothing or blankets. This can make the fever worse and cause fits or permanent brain damage. Be sure the child with fever drinks a lot of liquids, and follow the other instructions on pages 75 to 76 of Where There Is No Doctor. Know the signs of meningitis and get (or begin) treatment quickly. When your baby has diarrhea, prepare Rehydration Drink and give it to him every few minutes to prevent or correct dehydration. See Where There Is No Doctor, Page 151 to 161. Preventing dehydration helps prevent fits and brain damage (cerebral palsy). Cerebral palsy is a complex disability that involves many problems and needs. Therefore much of the basic information you will need is in other chapters. It is essential that you read Chapters 4, 8, 33 to 43, and 62 to 66. Throughout the book, important information about cerebral palsy has been marked with a in the margin. Many references to cerebral palsy are also included in the INDEX.